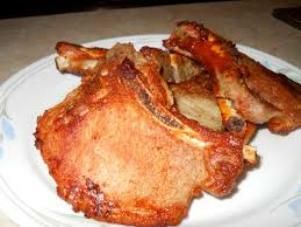 Chuletas Fritas (Fried Pork Chops) - Tienditadepuertorico.com - Buy Puertorican Food Here!! Wash and dry chops thoroughly. Mix Homemade Adobo, garlic, oregano and oil. Heat oil at medium high heat and brown chops on each side, about 3 minutes. Reduce heat to medium and cook turning over once or twice, another 10 minutes.